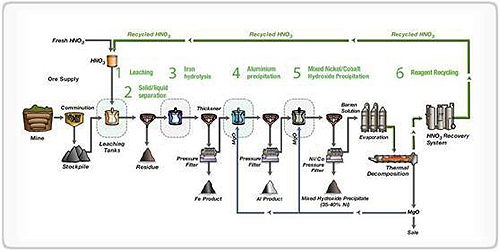 As an atmospheric hydrometallurgical process the direct nickel process has an impressive recycle and return statistic meaning 95%+ of the nitric acid is re-used, therefore providing good environmental incentive. There are two types of nickel ore deposits; nickel sulphides and oxidic nickel laterites. Three primary processes are used to extract nickel from laterite ore. Conventional pre-concentration techniques are not feasible for nickel laterites as the majority of the nickel is distributed in the iron oxides and clays. This is different from the sulphide ores as the nickel occurs in a discrete mineral. The limonitic ores are processed using acid leaching (hydrometallurgical), the saprolite ores are smelted (pyrometallurgical) and a limonite-saprolite blend can be extracted using the Caron process (pyro/hydrometallurgical). The Direct Nickel Process DNi is an atmospheric hydrometallurgical processing route designed to treat all types of nickel laterite ores, in a single flow sheet to produce a number of final saleable products. The key to the Process is the use of nitric acid as the leaching agent and the subsequent use of a patented recovery and recycling process returning +95% of the nitric acid for re-use. See below in Figure 1. The ore is mined and then fed to a comminution plant for crushing to ‹2mm. It is then mixed with the nitric acid to a solids percentage of between 20 and 30% and fed to the leaching tanks heated to 110°C. The residence time in the leaching tanks is between 2-6 hours with 4 hours being typical. During the leaching around half of the mass of the ore is dissolved into the nitric acid, leaving behind the acid insoluble minerals, usually consisting of silicates, and the pregnant leach solution (PLS). The solid-liquid separation of the post-leached slurry occurs in a series of counter current decantation thickeners (CCDs). After the acid insoluble residue has been separated from the leach solution it is washed and filtered prior to disposal in a residue storage facility. Following the CCD circuit the PLS is treated in the iron hydrolysis circuit where the PLS is heated in atmospheric tanks and nitric acid is distilled off for return into the nitric acid recovery system. During this distillation hematite, or Fe2O3, is formed as a solid in the tanks, effectively removing iron and chromium from the liquid. This slurry is filtered and the washed hematite filter cake is produced as a by-product for sale. The iron free solution is then treated with magnesia (MgO) slurry to increase pH and precipitate aluminum hydroxide, which is filtered to produce an Al product. The low aluminum solution is now ready for mixed hydroxide precipitation where magnesia slurry is again used to raise pH, in a two-stage circuit, and precipitate out the mixed hydroxide product (MHP), containing most of the nickel and cobalt recovered from the feed. The slurry is then thickened to separate the solid MHP as thickener underflow from the barren solution in the thickener overflow. The MHP slurry is then filtered and washed producing MHP filter cake, the primary saleable product from the DNi Process. Alternative commercial products such as nickel and cobalt metal, nickel/cobalt oxide or nickel/cobalt sulphides can be produced with additional modules using existing proven technologies. This entry was posted in Nickel, Uncategorized and tagged direct nickel, nickel, nickel process, nickel production. Bookmark the permalink.